The 34th annual Berlin International Film Festival was held from 17–28 February 1984. The festival opened with The Noah's Ark Principle by Roland Emmerich.The Golden Bear was awarded to the American film Love Streams directed by John Cassavetes. The retrospective dedicated to German-American actor, screenwriter, producer and film director Ernst Lubitsch was shown at the festival. 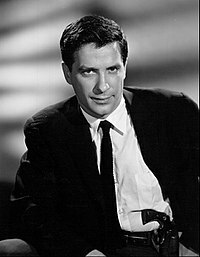 John Cassavetes, winner of the Golden Bear at the event. ^ a b "PROGRAMME 1984". berlinale.de. Archived from the original on 9 November 2013. Retrieved 8 June 2014. ^ "34th Berlin International Film Festival". berlinale.de. Archived from the original on 28 December 2010. Retrieved 21 November 2010. ^ "German Currents Festival of German Film in L.A." indiewire.com. Archived from the original on 26 September 2015. Retrieved 7 October 2018. ^ a b "PRIZES & HONOURS 1984". berlinale.de. Archived from the original on 15 October 2013. Retrieved 8 June 2014. ^ "JURIES 1984". berlinale.de. Archived from the original on 23 October 2013. Retrieved 8 June 2014.